The death of a Roman Catholic priest in Springfield, MA has been ruled a suicide. Police said Monday that the Rev. Paul Archambault (ARCH’-am-bault) died of a self-inflicted gunshot wound. His body was found Sunday at the Sacred Heart rectory. Archambault said Mass on Saturday at St. Mary’s in Hampden, and was scheduled to return Sunday. When he did not arrive, parish members contacted Sacred Heart. Police say there was no note. A Springfield Diocese spokesman says Archambault was last seen publicly Saturday night at Baystate Medical Center where he was chaplain. He was ordained in 2005. The latest design from al Qaeda’s top bomb maker is a “belly bomb” developed to beat airport security in Europe and the Middle East where full body scanners are not widely used, according to U.S. officials. According to U.S. officials, the terrorist would detonate the bomb with a chemical-filled syringe. “We do not think there would be enough to bring down a jetliner, but it is more likely the kind of bomb to be used in an assassination attempt,” said one person briefed on the warnings. U.S. officials told ABC News the “belly bomb” is the invention of Ibrahim Asiri, a young Saudi native who packed explosives into the rectal cavity of his 23-year old brother Abdullah for a suicide missions targeting the head of Saudi intelligence, Prince bin Nayef. In 1960, Penguin Books asked the 26-year-old Timothy Ware to write a book on his newfound Eastern Orthodox faith. His first reaction was to say no; he had been Orthodox for only two years. But a friend urged him to try and so he set his pen to paper. Now nearly 50 years old, The Orthodox Church remains the go-to book for people who want an introduction to Orthodoxy. 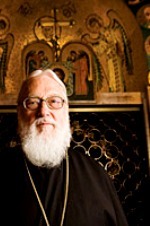 Since that first book, Ware became a monk, took the name Kallistos, became a lecturer at Oxford University, and was made Metropolitan Bishop of Diokleia for Greek Orthodoxy in Britain. Earlier this year, Ware lectured at North Park University and Wheaton College about what evangelicals could learn from the Orthodox and what the Orthodox could learn from evangelicals. Christianity Today editor in chief David Neff interviewed him during that visit. Has life really become so cheap? The controversial game, newly granted a Gambling Commission licence, will see players buy £20 tickets online. The winner will net £25,000 fertility treatments at one of the country’s top clinics. But the scheme seems certain to start a huge debate, particularly among religious groups who might view it as “selling” precious human life. Might? They “might” view it as selling human life? I wonder how else one could consider this? People as commodities has come full circle. Babies are the new black. Instead of being chained in ships, they’re stored in ice trays. Their only chance at life is to be purchased. England is in desperate need of a new William Wilberforce. How about just putting babies out for bid? How about ebay? Or maybe a game show where people are forced to eat bugs and swim with electric eels for a chance to win a human being. Or maybe babies should be sold straight up as commodities. Truly, how would any of those be different from the lottery? A 25-year-old Chandler man accused of burning his son’s hand and wrist because the child touched his Bible was booked Sunday on suspicion of child abuse, police said. Johnny Salazar was taking care of his two sons, ages 2 and 5 this weekend on the 800 Block of East Flint Street, police said. He shares custody of the boys with their mother, who lives in Casa Grande. Both Salazar and the boys’ mother live with their own parents. Sunday, Salazar’s parents returned from church and noticed the red blistering on the wrist and hand of the 5-year-old, and asked Salazar what happened, said Chandler Police Sgt. Joe Favazzo. Salazar told his parents he used a cigarette lighter to burn his son’s hand and the back of his wrist, Favazzo said. “The boy was touching his Bible and he thought the boy may be possessed,” Favazzo said. If it’s true, he should lose his custody rights. How can you burn a child for touching a Bible?! She harvested the son’s sperm before having his life-support switched off! I think it’s normal for my parents to want a grandchild. A hint every now and then from my mom about how she’d like to have a baby in the family again has been standard operating procedure since I’ve hit the later 20s. What’s not normal, however, is how badly Marissa Evans wants a grand-baby. She went a little too far. She harvested her dead son’s sperm. Marissa was devastated in 2009 when her 21-year-old son Nikolas sustained a life-threatening brain injury during a fight outside an Austin, Texas bar. He was on life-support for five days before Marissa, 44, had to make the terrifying decision to pull the plug. But before she did so, she was allowed to collect some of Nikolas’ sperm. And so the weird science continues. This is wrong evil on so many levels: ethically, morally and theologically. Very selfish of her, and I doubt that it will solve anything by this wicked course of action. The Daily Mail also has the story with photos here.